At home Richard Kuklinski was a dedicated suburban family man. On the street he was the Iceman, a professional hit man and lethal scam artist, a man so heartless he kept one of his victims frozen for over two years to disguise the time of death. His personal body count was over 100, but the police didn’t have a clue. 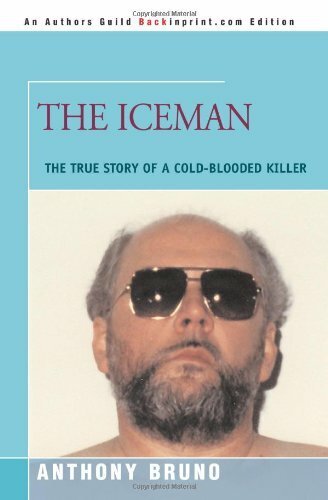 The Iceman exposes Kuklinski’s murderous double life. Crime writer Anthony Bruno is the author of Seven (based on the hit film starring Brad Pitt and Morgan Freeman), Devil’s Food, Bad Apple, and The Seekers: A Bounty Hunter’s Story with Joshua Armstrong. He was also a regular contributor to CrimeLibrary.com. A fourth-degree black belt, he studies and teaches the martial art, aikido. Smoothly written bio of a lone-wolf executioner for the mob. In his first nonfiction book, mystery author Bruno (Bad Moon, 1992, etc.) puts his writing talents to white-knuckle use with a tight focus on a killer with no human feelings except toward his wife and three sons. Kuklinski--who'd used derringers, shotguns, baseball bats, tire irons, knives, ice picks, and his bare hands to kill--had been dubbed ``The Ice Man'' by the New Jersey Police after it was discovered that the body of one of his victims had been stashed for two years in an ice-cream truck owned by a friend of the killer's known as ``Mr. Softee.'' A genius at assassination when he wasn't serving kids popsicles, Mr. Softee had schooled the Ice Man in the use of cyanide, a car- bomb invention called the ``seat of death,'' and other exotic methods of murder. Cyanide proved to be Kuklinski's first love: It was quiet and discreet--you could walk by your victim, spray his face with the poison while pretending to sneeze, and he'd be dying even as he crumpled to the sidewalk. Bruno details how Dominick Polifrone, a cop who grew up with the wiseguys in Hackensack, goes undercover and gets in with the cagey Kuklinski. The hit man wants cyanide and a rich Jewish kid to sell coke to, and Polifrone wants to record Kuklinski proposing murders. As cop and killer play cat and mouse, and the bartering goes bad, the danger of Polifrone being shot at any moment is torqued tighter and tighter by Bruno. Finally, Kuklinski is caught and tried: It's determined that he's committed approximately one hundred murders, including that of Roy DeMeo, a killer so dangerous that he intimidated even John Gotti. A fast-paced, suspenseful re-creation of how a vicious killer was run to ground. -- Copyright ©1993, Kirkus Associates, LP. All rights reserved.